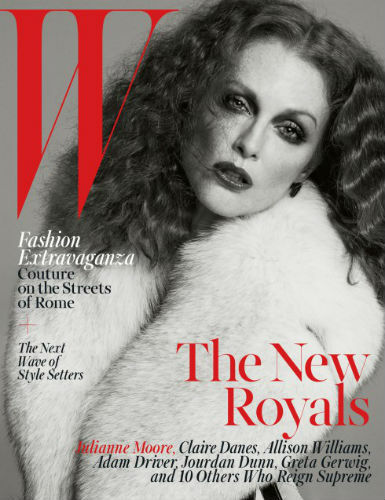 -I really like W magazine’s New Royals covers (especially Julianne Moore‘s and Claire Danes‘). Allison Williams‘s doesn’t even look like her, though. –Stephen Colbert had his first truly great interview on his new show last night when he chatted with Joe Biden on death, faith, and family. –Beyonce‘s my new hero thanks to her giant wine glass. I really hope she calls it Big Joe. -This blind riddle is totally about Justin Theroux, right? -Dammit. That Daily Mail report about Nicole Kidman joining Elisabeth Moss for the second season of Top of the Lake turned out to be false. That would have been killer! –Alison Brie really doesn’t need any more photos of your junk. Thanks, tho. -I didn’t watch Under the Dome after the first season because I value my brain cells too much, but the reviews of the finale are HILARIOUS. So angry! -“You try being 22, having a period and staying away from Google.” Jennifer Lawrence is all about the truth telling. -I have a fall TV spoiler ban, but I don’t think the new Scandal trailer counts because really, who cares about Scandal?! -The second half of this article about the rise of slog TV is so good. Nothing makes me feel more exhausted than seeing an ad for the new seasons of The Leftovers or The Affair. -It’s weird that Shiri Appleby is following up her UnREAL breakout with a show that looks DOA. I guess she should grab that CBS money while she can. -I didn’t realize Donald Glover was in The Martian until I saw this new clip. That must be why he’s at TIFF. I’ll be seeing him tomorrow night at Jason Reitman’s live read of The Princess Bride (now with Rachel McAdams as Buttercup!). I’ll try to sneak a Periscope or two if you’re interested. –Natalie Portman premiered her new movie at TIFF yesterday (I love how she cut off all questions about her dress at the pass), and she talked about how Broad City made her insecure about Garden State. -I don’t know anyone who still watches Grey’s Anatomy, but it’s always good to see Joey Lauren Adams getting work. –Joss Whedon cut this shirtless Chris Hemsworth scene from Age of Ultron. But whyyyyy??? –Neil Patrick Harris accepted Seth Meyer’ Actathalon Challenge last night. This is kind of impressive! –Norman Reedus, stop making it so hard to like you. -The X-Files reboot will have its premiere at New York Comic-Con. –Jessica Simpson says the show that made her a household name is her biggest financial mistake because logic! -Here’s the trailer for Michael Moore’s Where to Invade Next, which premiered at TIFF last night and is one of the few films here gaining some heat.